Aquanex has been used in a variety of clinical and research projects in swimming and aquatic therapy over the last 20 years. Aquanex sensors measured force on the hands, feet, paddles, fins, and several types of aquatic exercise equipment. A wide range of ability levels were tested – from recreational swimmers to world record holders. Many of the studies resulted in presentations and publications. Copies are available on request. Aquanex data are reliable and valid. The initial research on Aquanex showed that the system was reliable (measured the same value on repeated trials) and valid (measured the value that it was meant to measure). The validity was supported by a series of three experiments that found a greater force value: for competitive swimmers than recreational swimmers; for swimmers treated with an instructional intervention than without the intervention; and after being coached than before. Havriluk, R. (1988). Validation of a criterion measure for swimming technique. Journal of Swimming Research, 4(4), 11-16. Swimming performance improves rapidly with comprehensive analysis and instruction. The results demonstrate that even a relatively short duration of carefully targeted instruction can make a meaningful improvement in technique (as measured by the active drag coefficient) and performance (as measured by swimming velocity). A complete program includes a biomechanical model of optimal technique, force and video analysis, visual and kinesthetic cue instruction, practice at a slow speed to allow control, and individual feedback. Technique analysis and instruction improves performance more than swimsuit design. One week of a comprehensive program of technique analysis and instruction had an effect on the active drag coefficient that was 3.5 times as great as the effect from wearing a Fastskin®. While swimsuit design may make an immediate but minimal improvement, technique adjustments produce much greater though more gradual gains. Havriluk, R. (2007). Improving performance in swimming: Swimsuit and technique resistance factors. Swimming in Australia, 24(1), 22-23. Technology and complementary strategies expedite skill learning. An evaluation of swimmers’ skill level (basic, intermediate, or advanced) makes the appropriate technology more evident. Complementary strategies expedite the learning process – an optimal biomechanical model; visual and kinesthetic cues that complement the model; synchronized underwater video and force analysis; short swims at a slow speed with limited breathing; drills that isolate key technique elements; reminders before a swim and feedback immediately after. Havriluk, R. (2008). Improving performance in swimming: Technology and learning strategies. Swimming World Magazine, 49(3), 37-38. Hand force is directly related to swimming velocity. As swimmers increased their hand force, they swam faster. Swimmers with higher hand force values swam faster than swimmers with lower values. Consistent with theory, there was a quadratic relationship between hand force and swimming velocity. Technique analysis and instruction directed at increasing hand force throughout the entire stroke cycle will improve performance. Havriluk, R. (2004). Hand force and swimming velocity. In 15th FINA World Sports Medicine Congress. Indianapolis. 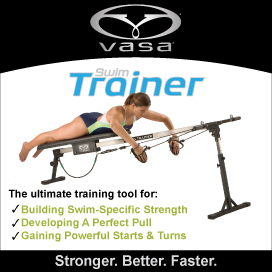 Swimmers benefit from strength and technique. Based on the results of this study, it was recommended that coaches help slower swimmers improve by emphasizing technique instruction and regularly measuring their active drag coefficient. Even the fastest swimmers can continue to benefit from improving technique. A detailed hand force analysis can help coaches identify wasted motion and force losses in the even the fastest swimmers to provide options that increase average force and achieve maximum performance potential. Havriluk, R. (2010). Performance Level Differences in Swimming: Relative Contributions of Strength and Technique. In P-L. Kjendlie, R. K. Stallman, & J. Cabri (Eds.) Biomechanics and Medicine in Swimming XI. Norwegian School of Sport Science, Oslo. Swimmers can improve butterfly arm entry to reduce shoulder stress and swim faster. Based on the results, it was recommended that coaches evaluate swimmers to ensure they eliminate the wasted time that their hands are above the shoulders at the beginning of the butterfly pull by adjusting the entry angle. A downward entry angle will result in a stronger arm position, a faster stroke rate, and less shoulder stress. Coaches can also encourage swimmers to begin elbow flexion as soon as the entry is complete. Hand force analysis reveals limiting factors in the fastest swimmers. An analysis of the pattern of application of hand force can reveal bilateral differences, force losses, and wasted motion. These factors were found on even the world’s fastest swimmers. Synchronized underwater video and hand force data shows the changes in arm motion necessary to swim faster. Havriluk, R. (1998). Hand force analysis in swimming. Invited presentation at II Encontro de Tecnicos de Esportes Aquaticos, Rio de Janiero, Brazil, August. Havriluk, R. (2006). Analyzing hand force in swimming: three typical limiting factors. American Swimming Magazine, 2006(3), 14-18. Olympic sprinters benefit from generating very high force on push phase. An analysis of the hand force of Olympic sprinters shows effective use of strength on the push phase. It was recommended that all swimmers work on increasing force on the push as it is critical to maximizing swimming velocity. Havriluk, R. (2011). Analyzing hand force in swimming: Characteristics of Olympic sprinters. Coaches Quarterly, 16(2), 13-15. Faster swimmers have a more effective technique than slower swimmers. Faster swimmers were found to have a more effective technique than slower swimmers, as indicated by a lower active drag coefficient. The results also showed an improvement in technique with age. However, the improvement leveled off for teenagers, showing a need for continued technique analysis and instruction. The coefficient of active drag was found to be a valid measure for the effectiveness of swimming technique. Havriluk, R. (2003). Performance level differences in swimming drag coefficient. In VIIth IOC Olympic World Congress on Sport Sciences. Athens: IOC Medical Commission, 93E. Anterior-posterior muscular imbalances in swimmers can limit performance. A training regimen that strengthens the arm abductors may not only decrease the incidence of injuries in all four strokes, but also increase hand force and, therefore, improve performance in backstroke. Becker, T., & Havriluk, R. (2006). Bilateral and anterior-posterior muscular imbalances in swimmers. In J. P. Vilas-Boas, F. Alves, A. Marques (Eds. ), Biomechanics and Medicine in Swimming X. Portuguese Journal of Sport Sciences, 6(Suppl. 2), 327-328. Bilateral symmetry can improve performance in swimming. Bilateral asymmetry is common in even the fastest swimmers. Improving symmetry will decrease resistance, increase hand force, and improve performance in swimming. Havriluk, R. (2007). Analyzing hand force in swimming: Bilateral symmetry. American Swimming Magazine, 2007(1), 34-38. Breaststroke pullout is faster with a dolphin kick. A dolphin kick during a breaststroke pullout provides a significant advantage over the traditional no-dolphin kick pullout. The advantage comes from enhanced propulsion from the kick but not the pull. McLean, S.P., Havriluk, R., & Brandt, S. (2008). Effect of adding a dolphin kick to a breaststroke pullout. Medicine and Science in Sports and Exercise, 40(5) Supplement 1:S377.